Most of us are familiar with the food pyramid. Released by the United States Department of Agriculture (USDA) in 1992, it depicted a simple visual breakdown of how many servings of each of the five main food groups a healthy, adult individual should strive for each day. A modified version of this was created by Tufts University for older adults to include high-fiber choices, and a reminder to drink fluids. In April 2005, the old food pyramid was replaced with MyPyramid, which emphasized physical activity as being an essential part of health and also reflected the new dietary guidelines and nutrient standards. In 2007, Tufts once again developed a version of the MyPyramid for older adults, aimed at those over 70 to show the differing needs of this demographic. After receiving criticism for being hard to understand and teach, MyPlate was brought in to replace MyPyramid in June of 2011. With its familiar shape and easier to understand portion sizes, MyPlate is today’s guide of choice. Shortly after MyPlate’s release, Tufts University published MyPlate for older adults. 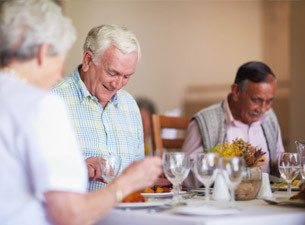 In 2015, the Jean Mayer USDA Human Nutrition Research Center on Aging at Tufts University collaborated with AARP Foundation, along with the new 2015-2020 Dietary Guidelines for Americans to update MyPlate for older adults, focusing on those 50 and older. 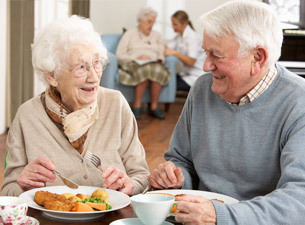 The reason Tufts creates the modified versions of these nutritional guidelines for older and elderly individuals is that as you age, your dietary needs change. Your body requires various levels of certain nutrients and vitamins depending on what stage of your life you are in, and its ability to absorb and create these essentials. Protein: As you age, it is estimated that on average, you will lose 3-8% of your muscle mass each decade after the age of 30. This is called sarcopenia. By consuming more protein or taking protein supplements, you may be able to slow this muscle loss and build more muscle, helping to increase strength and reduce the likeliness of falls and fractures. Fiber: Often, medications may come with unwanted side effects that fiber can help resolve. Diets higher in fiber may also help prevent diverticulosis, which affects up to half of those aged 60 and over in Western countries. Vitamin D: This vitamin is produced by the cholesterol in your skin when exposed to the sun. As you age, your skin gets thinner, reducing its effectiveness at creating vitamin D. This vitamin plays a critical role in helping the body absorb calcium. Eating foods that have a high Vitamin D content, or that have been fortified will help your body maintain sufficient levels. Calcium: A calcium deficiency often goes with a vitamin D deficiency. To counteract your body’s low levels, it may be necessary to add supplements or eat more foods containing calcium. Vitamin B12: Stomach acid is essential for separating B12 from the foods you consume. As you age, you may develop conditions or take medications that reduce the production of stomach acid, which can inhibit your body’s ability to absorb B12 properly. Eating an abundance of meats, eggs, and dairy products is a great way to add more of this essential vitamin to your body. If diet doesn’t help, taking a vitamin or receiving a B12 shot from your doctor may be needed. At The Holiday retirement communities, we offer a wide selection of nutritional meal choices to promote healthy living, a fit lifestyle, and follow the MyPlate guidelines. There are games, crafts, activities, and programs to help seniors live their life to the fullest and enjoy themselves. With regular excursions and outdoor events, we provide many different options to help keep our residents engaged, active, and happy. We take care of each one of our residents like they are our own family.